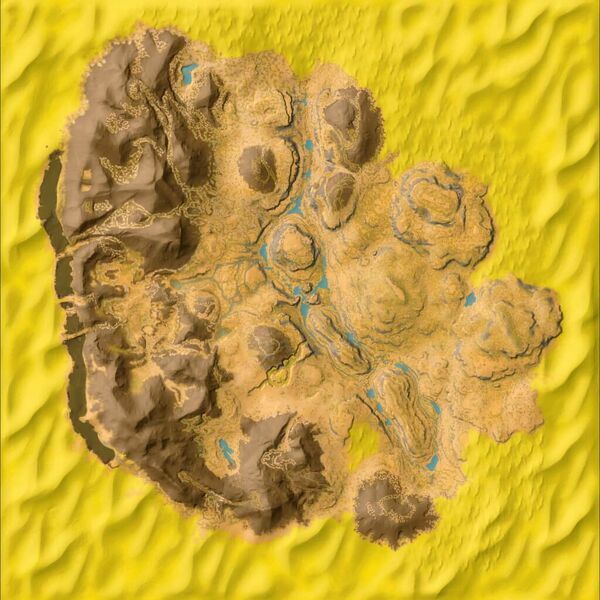 The Badlands are a location in the DLC: Scorched Earth. The Badlands is an area covered in low amounts of vegetation, almost no water, an abundant supply of metal nodes, and large dinosaur fossils scattered about quite frequently. In addition, the Badlands are the sole source of oil veins, making it a sought-after locale for industrial applications. One could build their home in the Badlands, however it is incredibly dangerous and not exactly recommended. Due to it having the only sources of oil veins, the Badlands is a perfect location to build industrial complexes. The Badlands are elevated above the Low Desert, and surround the Green Obelisk, with one of the Oasis beneath it. Without a fast and easy way to travel up and downhill, one will have to navigate their way around the rocky terrain. To the west are the Canyons, and to the east are the Dunes. If one chooses to spawn in the Badlands it is recommended that he/she heads for the Canyons to the west, for the Canyons are considerably cooler than the Badlands. It is important to look out for predators in the Badlands, for they could make short work of any survivor. Dangerous predators that could spawn in the Badlands are terror birds, thylacoleos, Tyrannosaurus Rexs, pulmomoscorpii, arthropleura, carnotaurus, titanoboas, titanomyra, and others. Keep an eye out for suspicious looking rocks, for they could be rock elementals in disguise. Use a magnifying glass or spyglass to check for rock elementals. If you see a green name, Do not get too close!